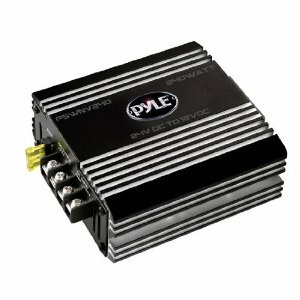 This power step down converter lets you use 12 V appliances in vehicles that normally supply 24 V of power. Now you can use your car stereo, CB radio, fog lights, etc. in your truck, RV, or bus! Get standard cigarette lighter voltage from your 24 V battery setup. This unit is capable of outputting 120 watts continuous, and up to 240 watts peak. For safety, it�s equipped with short circuit, overload, high voltage, and low voltage protection. The fuse is rated for up to 10 amps. Dimensions: 3.3" x 4.5" x 1.8"